Bryan is a global sales, marketing, growth and analytics executive with 15+ years of experience in building and leading high-performing global teams in the mobile advertising, ad tech and gaming industries. Bryan is currently COO at AppOnboard and was previously Chief Customer Officer at AdColony where he led the global performance organization with app developers and assembled a global team of more than one hundred that spurred the rapid growth and success of the AdColony app install business since 2011 (AdColony sold to Opera Software in 2014 for $350M). 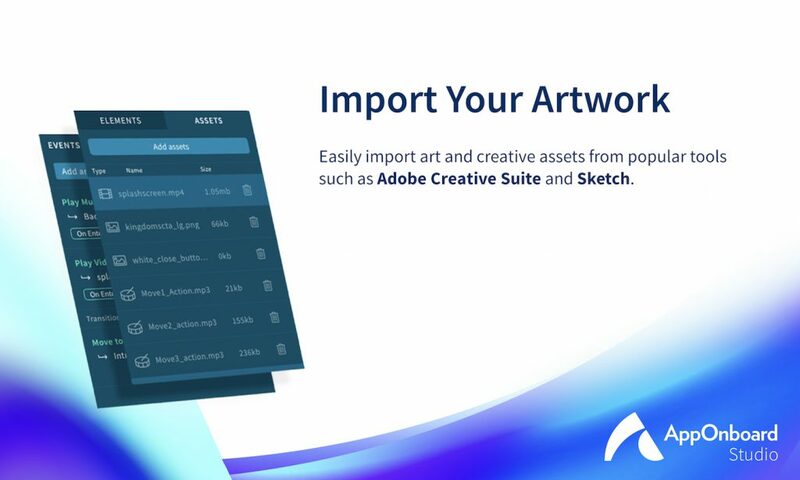 We are excited to announce AppOnboard Studio, to read the full press release click here. 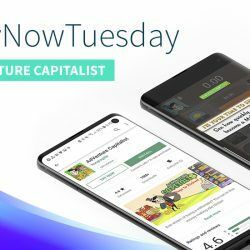 Today, we expect everything – our music (Pandora, Spotify, Apple Music), entertainment (Netflix, Hulu, Amazon Prime), transportation (Bird, Lyft, Uber), meals (Postmates, Instacart, Grubhub), help (TaskRabbit, Handy, Washio) – in an instant. Soon, we will even be able to travel long distances in an instant (Hyperloop). We don’t need to wait. We don’t need to have patience. We can make decisions in an instant. We have become the most demanding consumers and users the world has ever seen. Why do we still spend valuable time downloading an app, making room for it, and waiting before we can experience it? In 2016, AppOnboard was founded on a simple idea to solve a complex problem limiting the use, discovery and experience of mobile apps and games. While the entire global digital ecosystem had long since become “on-demand,” we at AppOnboard questioned the need to download, install and launch apps just to evaluate and try a new product or service. Why couldn’t we test-drive an app without having to part ways with personal videos, music, and other apps we actually use and need? If word-of-mouth is the most popular channel of new app discovery, why can’t we easily share apps with friends and access them instantly? 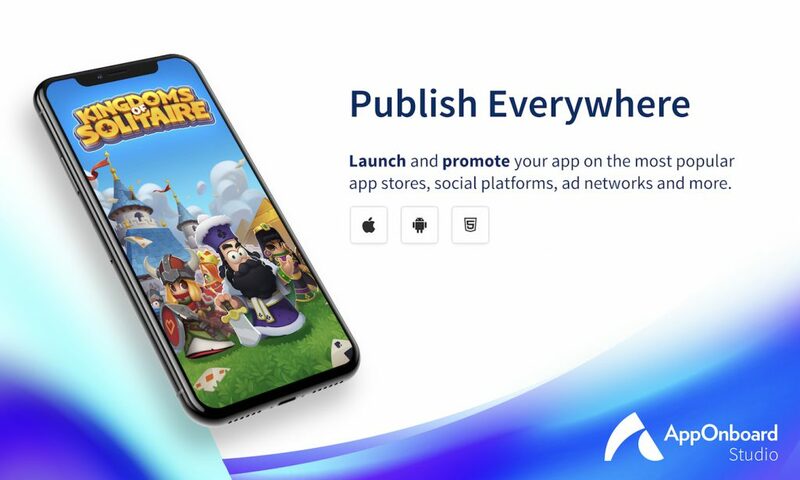 Over the last three years, we have been heads-down developing the technology and toolset to advance app and game discovery and shareability to satisfy the expectations of the on-demand user generation. The early years of AppOnboard were focused on reversing trends of app size growth and the challenges it created on mobile app experience and discovery. 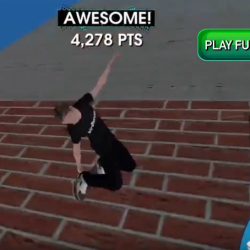 As we watched app and game file sizes grow 5x over the last 6 years, we created app demos and technology that transformed gigantic games (2GB+) into lightweight demos (<10mb) that removed 99.9% of file size. What happened next was remarkable and something we could have never imagined. 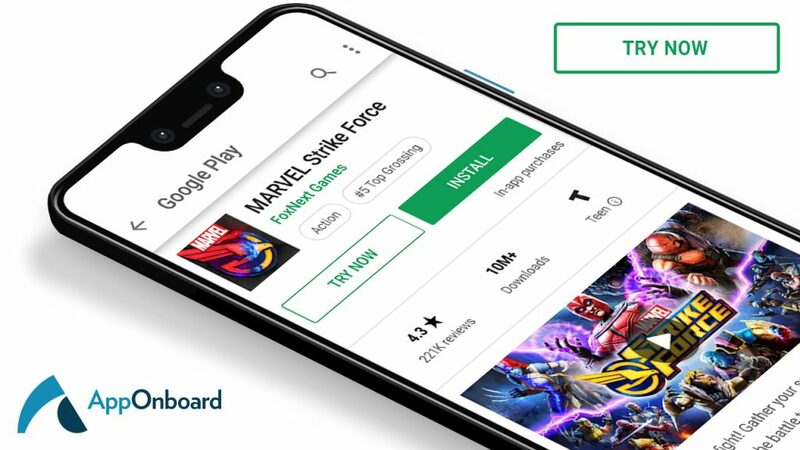 Over just a few months, AppOnboard became the largest provider of instant apps on the Google Play Store. We watched users around the world transform their behavior, shying away from app installations in favor of “Try Now” experiences where they could experience and discover apps instantly and on-demand before committing to installing gigabytes of app data. Finally, native mobile app experiences became on-demand and consumers were responding in a big BIG way. With instant app experiences, you can finally share an app with your friends and family without them having to visit the app store, remember their password, and install a large file just to try a new app. Instantly, apps have become sharable. 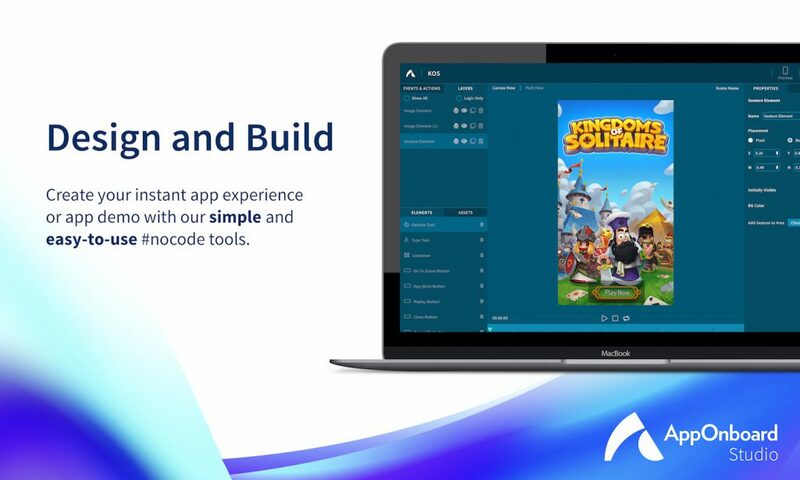 In the summer of 2018, as we were scaling the development of the creative tools we used to build app demos, we began to take notice of the #NoCode movement, and we started to ask ourselves, what if anyone could build an app demo? As we watched the cost of app development continue to skyrocket and require more specialized skills, coding, experience, larger teams, tools and engineers, we developed AppOnboard Studio to remove 99% of those costs. Today, AppOnboard Studio rolls out globally to some of the most innovative and inspiring teams of creators the world has ever seen. In a world where everyone has an app idea, but no one knows where to get started, we hope that AppOnboard Studio can provide an answer. We couldn’t be more excited to see the brilliant ideas that continue to come to life with AppOnboard Studio. To see more examples of app demos, check out our gallery. You can also sign-up for early access to AppOnboard Studio at www.apponboard.com. 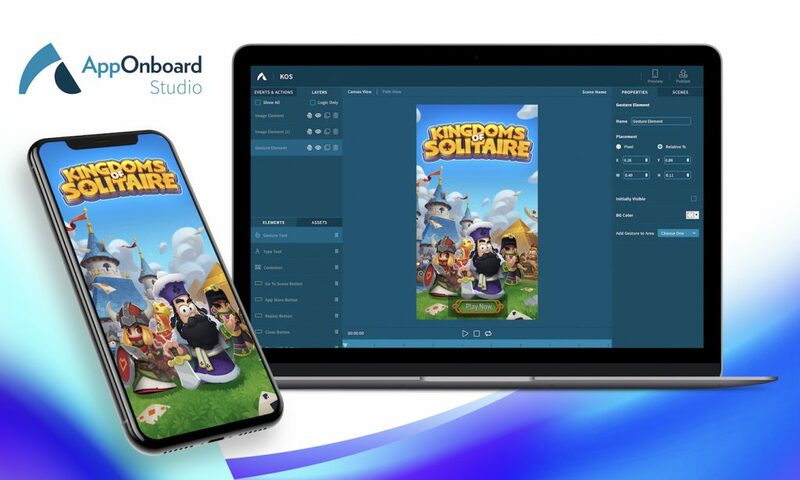 We have been amazed by the power of AppOnboard Studio and recently watched in awe as a small team of artists with a great idea and some early art assets leveraged AppOnboard Studio to bring their idea to life and create their first app.